First Healthcare Products was called on to help a large acute care facility in Pennsylvania create a custom solution for an inpatient room medication cabinet. The client was in transition to EPIC. They were in need of a medication distribution solution for over 150 rooms, 329 units. The goals were to keep patient medications as close to the point-of-care as possible, help reduce the opportunity for distractions and medication errors, and eliminate unnecessary medication waste. The medication cabinets needed to be designed to fit specific medication bottle and IV bag dimensions. Measurements and adjustments were made in a series of drawings to ensure that material fit. The units also needed to be equipped with the facilities lock vendor of choice RFID lock to ensure uninterrupted workflow for the caregivers utilizing prox cards. A MED CART ALTERNATIVE THAT REDUCED ERRORS AND INCREASED WORKFLOW EFFICIENCY. departments to understand the entire medication supply workflow. Multiple meetings and drawing revisions ensured the perfect JHACO compliant solution from production to installation. Understanding their challenges lead to a unique double mounted solution. 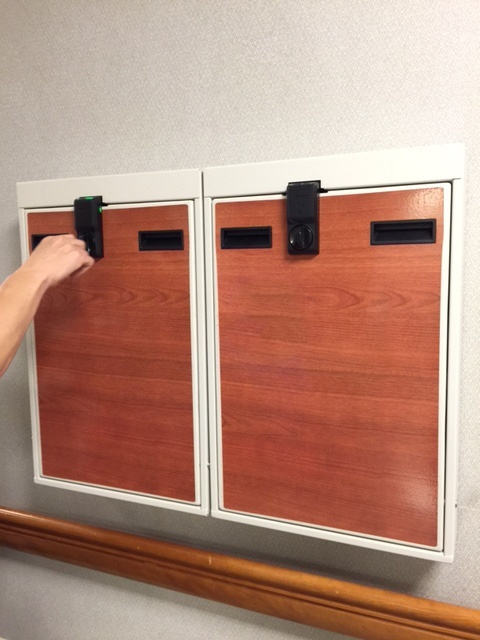 The medication cabinets allowed ease-ofuse by incorporating existing staff prox cards. This accounted for additional savings both in time and money while meeting goals to reduce medication errors and increase efficiencies. 329 medication cabinets were designed, revised and installed in the facility within 11 months. The units are helping reduce errors and medication waste. Ongoing support and service is provided as needed.